SICK has collaborated with Universal Robots to develop an entry-level vision-guided cobot system for pick and place, quality inspection and measurement. The SICK Inspector PIM60 URCap is simple yet powerful toolkit for creating a vision-guided robot task with minimum time and effort. By integrating SICK Inspector PIM60 2D vision sensors with Universal Robots’ UR3, UR5 or UR10 robots, SICK has developed an adaptable vision-guided cobot system that is quick and easy to program and configure without the need for a separate PC or specialist software expertise. “With the Inspector PIM60 URCap, it’s easy to add eyes to your robot application,” states Neil Sandhu, SICK (UK) vision specialist. “This entry-level package allows engineers to set up the robot to be guided to pick randomly positioned objects, as well as to inspect or measure the objects prior to picking. “Because it doesn’t need specialist programming expertise, it makes an ideal ‘starter’ vision-guided robotic solution for a production line, even on a small scale, and is sufficiently adaptable to equip a pilot process facility for production development work. The SICK Inspector URCap software has been developed to ensure easy integration between a UR3, UR5 or UR10 robot and the SICK Inspector PIM60 2D vision sensor. 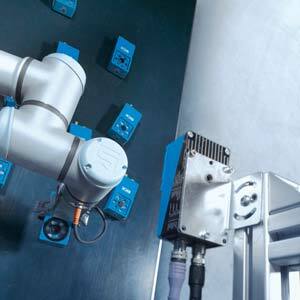 Standard configurations such as changing jobs and pick-points, calibration and alignment are done directly from the robot control pendant, making the everyday operations fast and straightforward. More advanced operations such as inspection and dimension measurement of objects prior to picking, can be done through SOPAS – SICK’s standard device configuration tool. The SICK Inspector URCap is also ready to expand through extra data fields that can accommodate results from both detailed object inspections and measurements. Use of the SICK Inspector PIM60 2D vision sensor is also an ideal way to experience the performance and versatility of SICK’s powerful 2D vision sensing range. The SICK Inspector PIM60 is an easily configurable, compact vision sensor for high-speed positioning, inspection and measurement, with flexible optics and integrated lighting (IR/White/UV). As well as having a capacity of retaining up to 32 reference objects in the device memory, the SICK Inspector PIM60 will perform inspections at high speeds, and offers a multi tool set for different inspection tasks: Blob, Object locator, Pixel-/Edge Pixel-counters, Pattern, Edge, Circle, Distance and Angle. The capabilities enable easy pass/fail verification of dimensions over digital outputs, as well as exact measurement value over Ethernet. Communication options include being able to connect the result and command channels through both EtherNet/IP and TCP/IP and a built-in web server, allowing monitoring of the process, and the ability to design a customised user interface (style, logo and functionality) to easily visualise and control the data needed from a specific robotics vison application.